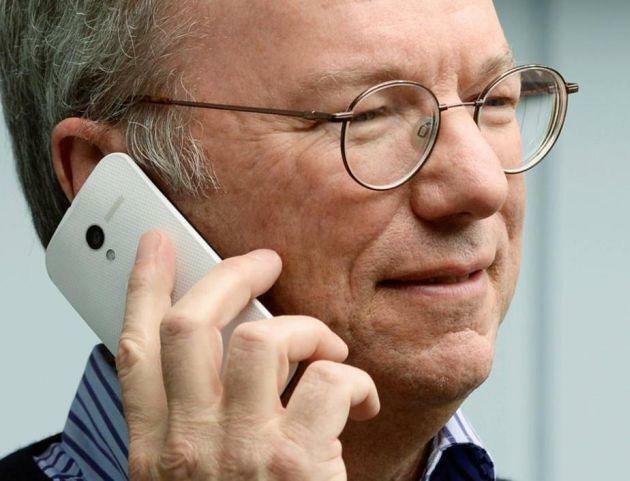 There’s no shortage of times when its good to be the boss and Eric Schmidt reminds us of that as he’s pictured using Motorola’s upcoming Moto X smartphone. Schmidt is attending the Allen and Co media conference in Sun Valley, Idaho and if I didn’t know any better, I’d say he almost looks to be intentionally posing with this device. Schmidt shows off a model with a white black, clear-as-day Motorola logo and an all black front. Think White Nexus 4 and that’s the color scheme we’re looking at with this model. The device appears to be slightly thinner on the outside with a little bulk in the middle and might just be design, or maybe that’s where the extra-long battery is hidden away. With rumors that this device will come to all four national carriers, our attention has suddenly turned from watching the Moto X news go by to a potential welcoming back of Motorola into the T-Mobile fold. A Moto X launch on the UNcarrier would be so very welcome and help wash away any lasting bad taste that remains leftover from the launch of the Cliq, and Cliq 2 launches oh so long ago. There’s a good look at the device from multiple angles in the gallery below so check it out. what? why should it be at teh bottom? people put phones in their pockets and bags with the top up, so the jack should be up top. bottom side makes for a more natural motion when putting the phone in or taking it out of a pocket. top side forces you to swivel it around in both cases, which leads to more strain on your wrist and more clumsy drops…. so you put your phone in your bag or pockets top side down? well, tomato, tomato, everyone does it differently. Unlike normal mp3 players, phones tend to get docked; especially in the car. I hate having the jack at the bottom because I can’t plug in to my stereo jack when it’s in my dock’s at home or in my car.. I know, some of the really cheep car docks have an semi-open bottom.. but I like having one that has power run to it..
That would be a preference issue then. I do not have to swivel the phone around when I put it in my pocket. I understand what you are saying, cut everyone is different. Most manufacturers have kept it on the top for a reason. what are the rumored specs? it looks like a budget 4″ phone. I kind of like the design. My only concern would be the hump on the back. Other than that, it’s a very nice looking phone. 1.7ghz dual core processor, 720 screen, 4.3″ screen, 2g ram. It is supposed to have a really good battery life. Don’t think it will have expandable storage. We should officially find out soon. I have a GS3 and love the size (4.8″) so I am not sure how I would feel about downsizing. lol I will probably have to go in to a store and play with it before making a decision. I also would have expected Moto and Google to stick with the lager (4.8″ or so) size, and hopefully better specs. If the battery does end up being a really good one, it might have some pull in my decision. I liked the original CLIQ. ..this doesn’t compute. You like the old Motoblur?? The Cliqs were absolutely horrible phones. I dreaded seeing an account with one on it, because they were most likely calling in with a phone issue. Did they abandon MOTO Blur though? For some reason it seemed like it was only on T Mo phones. The phone looks nice, the only thing that I would need to consider would be that hump on the back. It could make the phone “not stable” when put on a table. Meaning the phone would more when put on it’s back. Other than that, if the specs are not too bad, I could see myself getting this one. Specially since Moto is planning to keeping their offerings very close to stock. I would hope, this and the Google ownership would mean faster updates. An official announcement would really be appreciated. I still use my Sensation 4G and it has a curved back. I have zero problems with that, and it feels more natural in the hand I think. Sure, it can rock a tiny bit when laying on its back, but I haven’t found that to be an issue. Nice!, thanks for the comment. That makes me feel better about possibly getting this phone. Really appreciate it. I think the hump might indicate that there is a big sensor behind it. Also, looking at that lens, I suspect it might have optical zoom and nice camera internals. You are correct the phone wobbles if you type on it while it’s set on a table, however the curvature does feel natural and great in the hand which is the reasoning behind it. Thanks for the response and information. Really appreciate it. I doubt google will launch the phone with mid range specs, but we’ll see. It does look nice design wise though. It wouldn’t surprise me if they release devices with mid-low range specs to keep the price low. Part of Google’s philosophy is to get devices to as many people as possible. Then they can mine more data and sell more apps. They have the Nexus line for cutting some corners. Motorola will be used for high spec’d phones. What does this (rant) have to do with this article? I’m I missing something? Hmmmm, I’m not a huge fan of the looks, but it seems that the phone might have some excellent ergonomics. I’ll reserve any real judgments till I actually see one in person though. Looks like a cheap HTC One. It doesn’t look anything like the HTC One. The curves and shape is nothing like it? What makes you think it looks anything like it, besides it being rectangular? I work for a market research firm in Seattle and we do usability tests for new phones all the time (optimus g2, s4, etc) before they’re out or even officially announced. We did one for this phone a month ago and I can tell you -it feels smaller than a nexus 4 in the hands and it has no hardware buttons and a soft touch backing. It’s nice but nothing I’d own. The specs are on par or possibly even a little worse than the nexus 4…. this is no superphone. It will be a nice addition to the play store though that I’m guessing won’t be priced very high. Hey genius, the pictures clearly show hardware buttons……. Well obviously it has a power button and volume volume, genius. By hardware buttons I mean home, back, search, etc. It has the in screen ones. Can you just take the phone out of the pocket and say “OK, Google …” without touching any buttons? The rumor was that it has always-on hotword detection for launching voice search/actions. One thing that I really don’t understand is that after acquiring Motorola a few years back, we have not seen or heard about a Motorola Nexus smartphone. Come on Google, show some more pride that you devils bought and use it to make one of your premier smartphones! David did we miss something in this posting? By what Mr. Wonderfully wrote,aka Jeff. I’m really hoping it doesn’t have less than a 4.8 inch screen. It’s around 4.5-4.8 not positive on the exact size. Defnitely don’t quote me on the screen size, it’s either the same size as the nexus 4 or smaller…it certainly felt smaller than the Nexus 4 but that doesn’t necesarily correlate to screen size. The reason I couldn’t really tell is I’m a daily Note 2 user so anything below 5″ is hard for me to pinpoint since I’m so used to large screens. I’m pretty certain it’s not 4.8″ or higher. If u compare the hold in his hand seems like 4.5 inch but it could be more better if back and front b same color ..
“I’m not allowed to comment on the nature of this phone.” Haha that’s great. Looks interesting, but I’d go with a different color scheme. Can’t wait to give it a shot.